If you are not 100% satisfied with your DecksDirect purchase, you can return unused product for a replacement or refund. We make returns and exchanges easy and are happy to help you choose the right product. Please read our return information below for full details. Whether you ordered too much or you are not happy with your purchase, you can return all non-sale items that are in resellable condition for a full refund with No Restocking Fees within one year of your purchase. DecksDirect is not responsible for return shipping costs. See Terms of Return below for full details or Request a Return online. We want you to be satisfied and will work hard to ensure that you are. If you experience any issue with our products, customer service, shipping, or even if you just plain don't like what you bought, please let us know by calling 1-888-824-5316 or emailing us at hello@decksdirect.com. We understand if your new purchase doesn't work out the way you imagined, so we've made the return process easy. We offer a complete refund within one year of purchase. Looking to return and receive a replacement? You can expedite this by placing and paying for a new order, then return unwanted items for a refund. We’re sorry, we cannot accept returns more than one year after your order was placed. Please do not send items back without first receiving an RMA (see below). If you refuse your shipment at the time of delivery, all return shipping costs plus a refusal fee will be deducted from your refund amount. Product ordered more than one year ago. Product not in original/resellable condition (product is damaged, used, or missing parts). Product purchased as part of a kit or package deal, unless the complete kit is returned. You can request an RMA by either submitting a Return Request Form online, emailing hello@decksdirect.com or calling 1-888-824-5316. Please be ready to provide us with the order number, part number, description, and quantity of the item(s) you wish to return. To protect the item(s) during shipping, place the product in its original packaging then in an additional outer shipping box. Please add sufficient padding to fragile items as needed. If damage is incurred during shipping due to improper packaging, a full refund will not be issued. Return all parts, pieces, printed materials, and accessories. Do not write on or alter the original packaging in any way. Once your return is received and inspected, your refund will be processed and we will send you an email confirmation. There are a few key points to note before returning your items to us. 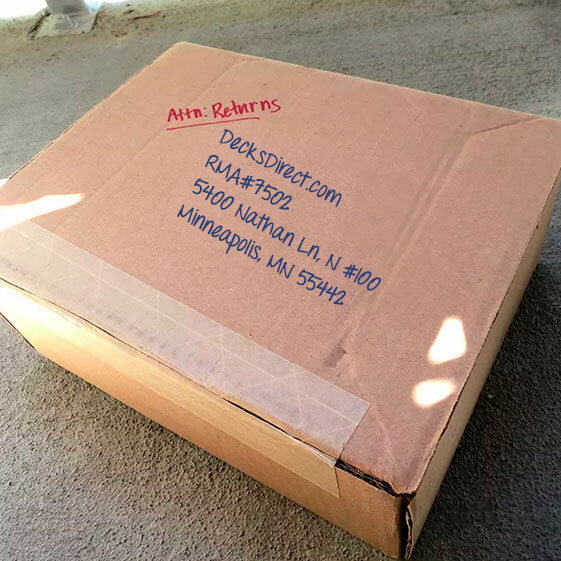 Please do not send items back without first being issued an RMA. If you are unsure if your items can be returned, please check with us by calling 1-888-824-5316 or emailing us at hello@decksdirect.com.  Product ordered more than one year ago.  Product not in original/resellable condition (product is damaged, used, or missing parts).  Product purchased on Sale/Clearance/Closeout.  Tools designated as non-returnable.  Product purchased as part of a kit or package deal, unless the complete kit is returned. Product must arrive to DecksDirect in resellable condition – All returns are manually inspected, and the items must be in resellable condition. All returns must be unused and in complete packages. (For example: we will not accept nine balusters from a ten-baluster package.) Stain products must be returned in their original reinforced, double-walled shipping box. If we receive stain that is damaged or spilled due to improper packaging, a refund will not be issued. Refund amounts – Any refund or credit for exchange will be based on the value of the merchandise at the time of purchase. Shipping fees are not eligible for refund unless the merchandise is defective or a shipping error occurred. Restocking fees may be deducted from the refund amount if items are returned in damaged condition or without all of the original accessories. Shipping costs – Shipping costs are the customer’s responsibility unless merchandise is being returned due to defect or an error on the part of DecksDirect. Please inspect your shipment thoroughly upon delivery and report any damage or errors ASAP. Please email photos of the damage or defect (if applicable) to support@decksdirect.com. Replacements for damaged goods will not be shipped until our support team has received photos of the damage. If part of your order is incorrect or missing, please contact us immediately at 1-888-824-5316 or email support@decksdirect.com. Please be ready to provide us with the order number, part number, description, quantity of the incorrect or missing item, and a photo (if applicable). If incorrect product was shipped to you, a prepaid FedEx return shipping label will be provided via email. Once the incorrect item is dropped off at FedEx for return using the provided label, a no-cost replacement order will be shipped. For products that appear to be defective within 90 days of purchase, a prepaid FedEx return shipping label will be provided via email. Once the defective item is dropped off at FedEx for return using the provided label, a no-cost replacement order will be shipped. All defects that occur after 90 days from your purchase date (example: a deck light bulb burns out after six months) need to be reported directly to the manufacturer to begin their warranty claim/replacement process.